I cannot believe it is already Memorial weekend. Besides, it is almost June and time for summer to begin. There is one project that will need adult supervision or teen help because it involves using a craft knife. 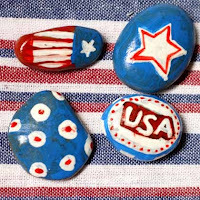 Paint rocks with acrylic paint using whatever designs you choose. Allow paint to dry. Then, spray each rock with clear acrylic spray to seal in the paint. Use your scissors to cut the elastic on the ironing board cover fasteners to fit to the back of your painted rocks. Glue each clip to a rock using your strong glue that can bond non-porous materials, such as E6000. Allow glue to dry (it may take several hours for the tablecloth weights to fully dry and you may have to wait to use them at your next picnic). To use, clip each Memorial Day Tablecloth Weight to each corner of your picnic tablecloth to keep it from flying away. Apply glue to a scrap of cardboard, about 3-1/2 inches wide, cover it with aluminum foil, and smooth out any wrinkles. 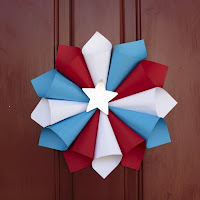 Cut the covered cardboard into a star shape (download our template). Apply glue to the back and press it onto the center of the wreath, then let it dry. Cut a strip from your cardstock that measures 1/2-inch wide and 8 inches long. 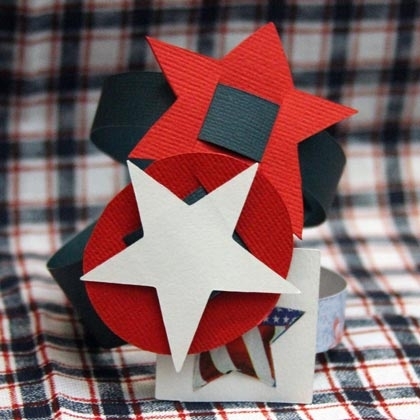 Cut a medallion (circle, oval, star, or square) about 2 inches in diameter from a contrasting color of card stock. Mark two slits on the back side of medallion, a little wider than the 1/2-inch strip. Cut slits with craft knife (adults ONLY). Slip 1/2-inch strip into one slit, and out the other. Slide medallion onto center of paper strip. If desired, cut out small patriotic photos from catalog or use your cardstock to make a star or flag and glue on top of medallion, covering the paper strip that is peeking through. Alternately, stick stickers on paper medallion and bracelet band to decorate. Tape to fit comfortably on child's wrist. Trim excess paper, if desired.